One seldom drives in the middle of a road, so why waste gravel. This is how one truck load of gravel can be extended to half or double the normal distance. Manage for more all weather pasture roads for the same price. Texas -- Several months ago a cattle deal was done. There was a willing and happy seller and a willing and happy buyer from a distant state. After the purchase, delivery is sometimes the bigger issue. Several weeks later a reasonably priced hauler was located that could pick up the Texas cattle as part of an extended route. This purchase would be a segment of the load which involved several other locations. The price was right for the hauling, the plan seemed like a good one. When the trucker arrived, Texas was flooded. Several inches of rain had soaked the entire area. Not only was it impossible to back into the loading area, the cattle were knee deep in mud and impossible to corral. The purchase wasn't going to happen. The deal died. The organization, negotiation, planning and a beautiful dream ended after 8 inches of Texas downpour. Marketing of registered cattle needs to be an all weather business. To be ready to provide cattle for sale, show cattle to a buyer, and take a client around a pasture to make selections may take some special planning. Road materials of gravel, slag, limestone, creek stone and several types of local natural road base are available to purchase in every area. It is a matter of locating a good source, identifying where and how roads should be developed, and then do it. Professional haulers of gravel have a way of opening the rear dump just over an inch, drive at a certain speed and deposit the desired amount of stone. The thickness of this apron of stone will determine the quality of the road and also the cost per 100 foot section. Most truck loads cost $300 to $400 per load delivered, they lay about a 3" deep pad and a load will go about 200 feet. All of this is subject to types of material, skills of the driver, etc. Gravel trucks are 8.5' wide. By placing a 6" square wood block four feet long in the center of the inside dump door, it will allow only the release of gravel in areas directly where the wheels track. 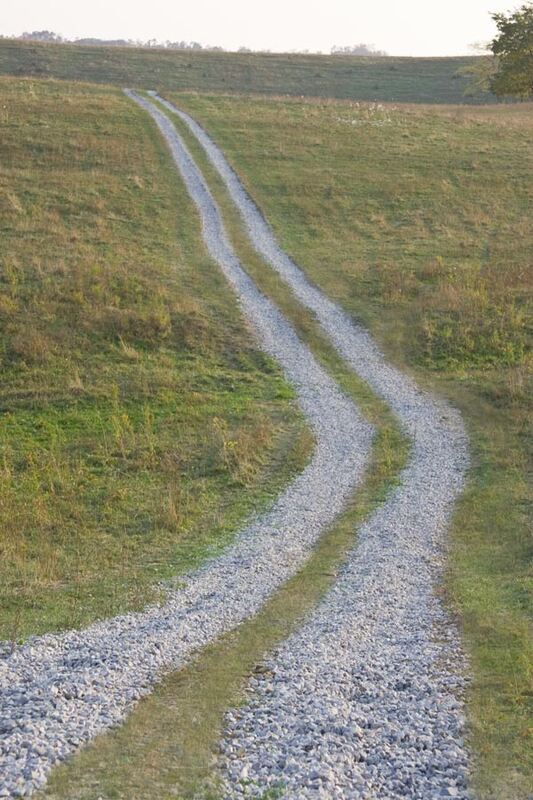 By using this simple block trick a pasture road can stretch almost twice as far with the same load of material. Provide a block to the trucker before he loads and you have it. For a gravel investment the value of an average cow, everyone can be an OFF ROAD, ALL WEATHER Texas Longhorn wheeler and dealer.